The living roof of California Academy of Sciences, photographed by me last August. Last weekend I got my garden design kick as the energetic Northwest Horticultural Society organized their spring seminar with theme American Garden Design from Dumbarton Oaks to Living Roofs. Despite the glorious, warm day outside the dark auditorium, I happily sat through a full day of knowledgeable presentations, enjoying all wonderful pictures from the large estate gardens of the early 20th century to modern, sustainable designs and energy-saving living roofs. 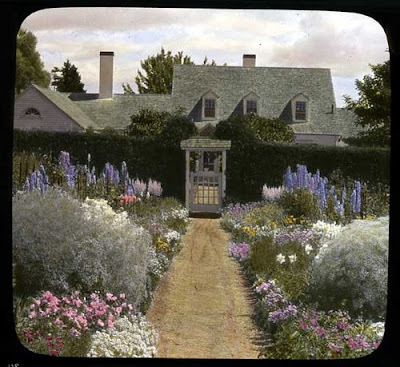 A garden by Beatrix Farrand, a lantern slide from the Archive of American gardens. Beatrix also designed the famous gardens at Dumbarton Oaks, now a research centre for garden and landscape history. The first presenter, Judith Tankard, is a well-known landscape historian specialized in the Arts and Crafts era together with the garden designing successors to this style in the US. The gardens of this wealthy period with all their architecturally designed garden rooms, evergreen hedges and billowing borders of perennials have almost been idolized to death, so it is easy to feel a bit weary about them. Concentrating on Beatrix Farrand and Ellen Shipman, the two most successful female garden designers of this period in the US, Judith was able to make her subject feel alive again, showing luxuriant gardens on hand-colored lantern slides, many of which came from the Archive of American gardens available for viewing online. The Riverside garden in Carmel by Bernard Trainor, picture from www.gardendesign.com. 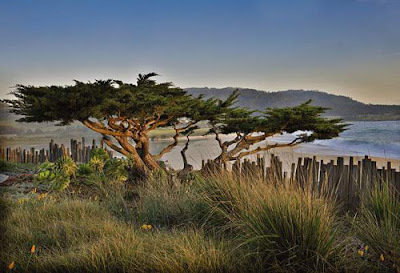 The greatest habitat for native plants within the San Francisco area... according to Paul Kephart. The grey gravel lines contain and cover the drainage system. The last presentation was by Paul Kephart, who told about living architecture like vegetative roofs. Paul has for long researched the natural habitats of California, and applies now his knowledge as part of the cutting edge, ecological architecture of today. I was most impressed by Paul's perseverance in researching the best combinations of plants for every site, and then measuring the results, sitting for hours and counting the butterflies and birds that are attracted by their new urban habitats. The living roof of the Californian Academy of Sciences was one of the projects he showed, and when I saw it last August, I had no idea about the amount of research, preparation and work that went into that undulating, elegant living roof. I highly recommend checking out the project pictures on Paul's website showing the thousands of ecological "biotrays" with plants being assembled on the roof! What a living puzzle. Intressanta projekt och fina trädgårdar, fast jag känner mig lite dubbel inför Living roof - rent estetiskt alltså, annars är ju tanken utmärkt. Favorit här är nog Ferrand, väldigt klassisk, men skön som en akvarellmålning, det är jag svag för. That roof is fantastic, I would love to have somthing like that. I really like to go to a few gardening seminars. What they do is really help me to gather ideas for my next organic garden. Keep up the great work on this blog. Wonderful images of the Cal Academy's living roof, and kudos to you for the synopsis of the seminar. Interesting to hear your comments on Craig Bergmann's work. I knew of him when living in Chicago, of course, and the one image that stays with me is a show garden he created when the Chicago Flower & Garden Show started up again just before I moved west. His creation was the most creative and entrancing of all, especially given the horrible backdrop of McCormick Place, where the show took place at that time (thankfully, it's no longer there.). But that said, I would imagine his garden designs are typically in the English tradition? Trainor's work I alway enjoy. Perhaps because I feel a strong connect to Eastern Australia since I began gardening in the Bay Area. Sorry I've not been by here more often. The black hole of social media and creating the new web site has been a terrible drain on my time. Best to you.... with Spring in the air!